Why do we tip? Some people will tell you it is a a reward for a job well done. Most people just do it out of habit. Sometimes it’s added to our bill, and we don’t even think about it. However, I’ve been reading up on it lately, and researchers say we tip out of sheer guilt. Some servers, myself included, are convinced that they determine their fate. Some servers say to themselves, If I do a great job on this table, they’ll tip me well. But, after much thought, I realize that there aren’t many factors that go into how most people tip. When I thought about it further, I realized when ever I go out to eat, I always leave 20% minimum. If they are absolutely a terrible server, I leave 20%, and if they are good, but nothing special, I probably leave 25%, and then if they exceptional, and everything is great, I’ll leave more. So if you think about it, it doesn’t really depend on the hard work of the server, it depends on the patron. Some people are good tippers, and some people aren’t. I truly believe, rarely, it depends on the service. So where does the guilt-factor lie? There is also the socially acceptable tippers. Going along with people feeling bad about being waited on, we tend to tip better in places where we’re having a better time then the people who are waiting on us, such as in the bar, restaurants, or when we are getting something done to better ourselves, such as at the nail salon, or when we get our hair done. Bruce Rind, a Temple University psychologist researched the effects the weather has on tip amounts. He found that it actually does play a role. After conducting a study in a room with no visual clues to the weather, Rind found “when the server told guests that it was raining, tips averaged 19 percent of the bill. But describing sunny skies sent the gratuity rate soaring to 24 percent." [Source: Pyschology Today]. Some waiters found a few factors that also increase the size of their tips. 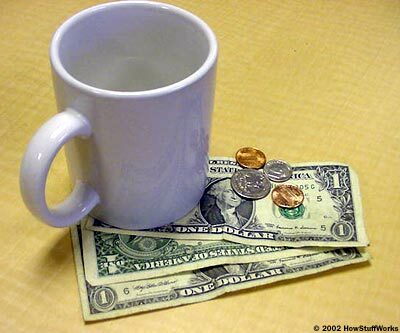 There was a 2% tip increase when the server briefly touched or made contact with the patron. There was also a 2.5% increase in tip when the server squatted next to their table when taking the order and conversing with their customers. Making eye contact and the intimacy of the connection between server and customer makes people want to give their server more money. Giving candy to your customers, or being extra helpful, such as closing the blinds if they are getting a glare, or offering to get a special request taken care of by the kitchen staff, showed almost a 3% increase in tips. [Source: Center for Hospitality Research at Cornell]. But, if we did away with tipping, restaurant would have to pay their employees minimum wage -- or more! -- and servers don’t like that idea, anyway. Most servers like to believe they are determining their own fate. Let me know what you think! Do you always tip roughly the same amount, or does it truly depend on the service? I've never worked in the food service business, but I do appreciate good service. I will tip extra for great service (getting a complicated order right and getting extra sauce to take with my leftovers) or less for exceptionally poor service (making me wait for a long time when I was ready to leave 15 minutes ago). But in general, I agree that most people tip the same all the time. And a lot of people think "they're already getting paid, why do they need a tip?" But this is particularly inaccurate for restaurant employees who make $2 or $3/hr unless you tip them. I never knew that before my husband (previous waiter) explained it to me.